I am so fortunate and so grateful that I don’t have to deal with a situation like Elyn Saks does – continuous and terrible thoughts/episodes that touch everyone around her and can derail lives. Humbling for sure and it makes you more mindful of taking a second to stop and think before doing/saying anything rash to anyone as you never know what somebody is experiencing or has gone through in the past. Finally convinced to take medication and while it helped, it also had bad side-effects – grogginess, lack of clear thought, irritation, etc. Achieved tenure at USC and found a very nice man who soon became her husband. She was finally on a medicine that worked for her and almost immediately her delusional thoughts and episodes retreated. 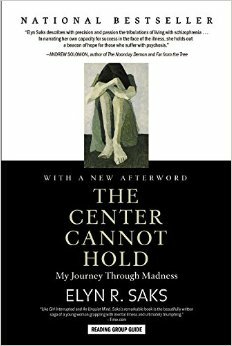 This entry was posted in Books and tagged Elyn Saks, Mental Illness, Psychology, Schizophrenia on March 29, 2015 by Blas.